LAPP: This name stands for innovative connection solutions like no other. Our brand stands for quality, customer service and a deep understanding of the industries and applications in which our products are used. We are the world market leader, supplying everything from cable, connectors and accessories to fully integrated connection solutions. LAPP products are used in production machinery, industrial robots, public transport, food processing, alternative energy, charging systems for electric vehicles, oil drilling platforms and much more. They are the product of choice for mountain climbers and polar explorers. With a global workforce of 4,245 people, we generated over a billion euros of turnover in the past year. Our customers appreciate our expertise and service. The 40,000 products in our catalogue reflect our manufacturing prowess. We always want to offer the best solution. If the customer cannot find what they are looking for in our catalogue, our experts are on hand to develop a solution together. LAPP delivers to every corner of the world, with most products ready to be delivered quickly off the shelf. To guarantee this, we have development centres, production facilities and warehouses all over the globe. With 44 sales companies and around 100 national partners, our customers always have someone to talk to. 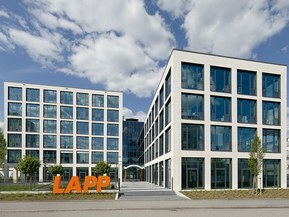 LAPP is well positioned for the future, just like Oskar and Ursula Ida Lapp were when they founded the company in 1959. In 1957, Oskar Lapp created the ÖLFLEX® control cable, the first protected trademark in the industry. More quickly followed. Throughout its history, the business has always been in family ownership. In Matthias Lapp, the third generation of the family has now begun to assume responsibility for the Company.